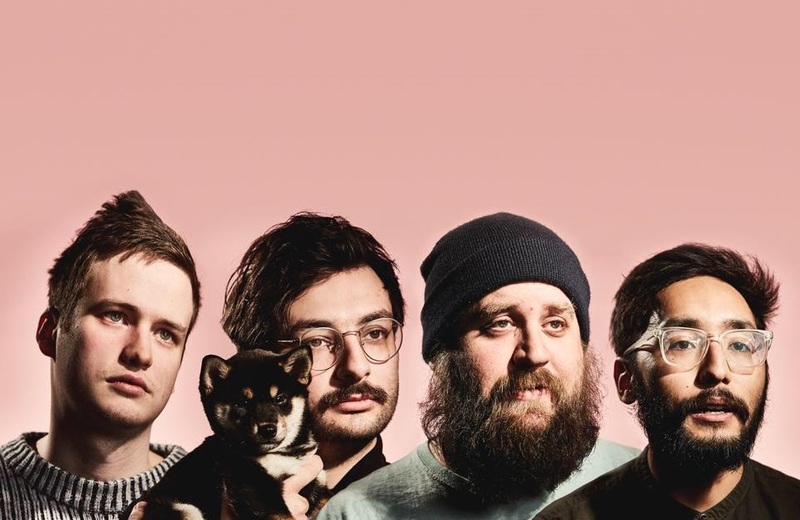 With the release of their third studio album, the members of Foxing are boldly stepping out and carving their own space in the industry. From bagpipes to synths, from lighthearted joking to religious imagery, ‘Nearer My God’ is Foxing’s most ambitious album yet. Foxing have boldly stepped out of a three-year hiatus with the release of their third studio album, Nearer My God (out August 10, 2018 via Triple Crown Records). Finding the St. Louis band staying true themselves, Nearer My God is emotionally charged – being both lyrically vulnerable and musically complex. 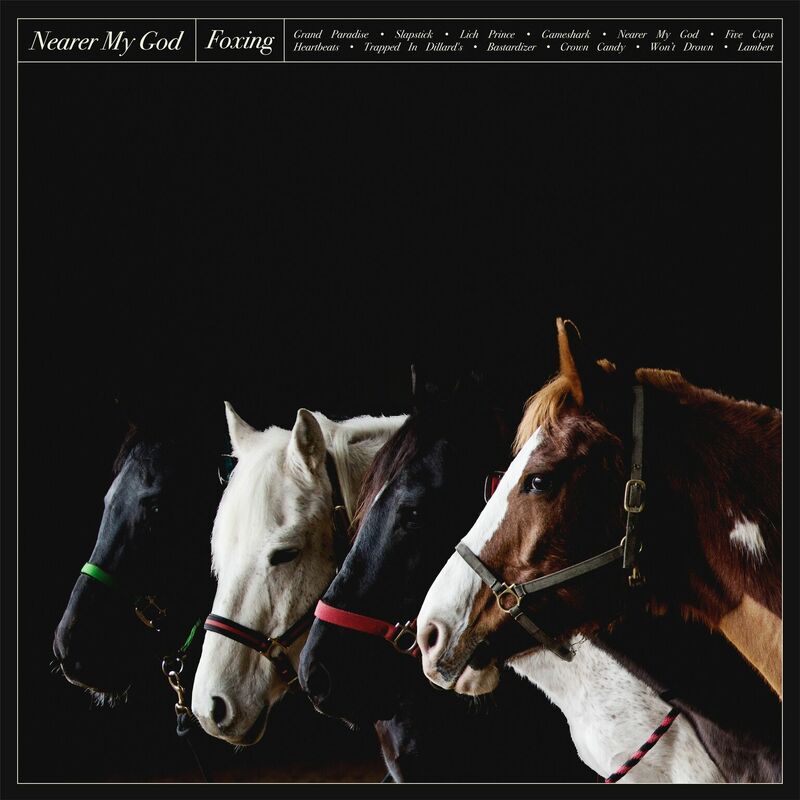 Nearer My God is undoubtedly the band’s most ambitious album to date, with the band utilizing string samples and bagpipes, electric guitar and synth. One quick listen through the record makes it clear that Foxing enjoyed experimenting with sound and playing with genre. While songs like “Slapstick” might feel more familiar to fans who fell in love with Foxing prior to this album’s release, other tracks such as “Gameshark” or “Heartbeats” take the band into new territory, the tracks’ musical tech adding personality and energy to their sometimes pleading and dark lyrical content. This experimentation paid off in the eyes of critics and band members alike, with major publications such as Pitchfork labeling the album a success and lead singer Conor Murphy walking away with genuine feelings of love and pride for Foxing’s third record. Though the subject material may feel vastly different between all these tracks, they’re tied together with much deeper meaning; whether the narrator is locked out of the music industry, the gates of Heaven, or from a relationship with his father, the narrator is struggling with a sense of belonging. It’s somewhat refreshing to hear Murphy joke about wanting to be “the crown centerfold” in one moment, while touching upon religion in the next. In doing this, the members of Foxing have perfectly illustrated life, where we can laugh in one instant and feel pain in another. Nearer My God is a triumph. Big, daring, and honest, every minute is emotionally gratifying. With all the excitement surrounding the album, Atwood Magazine interviewed Foxing’s Conor Murphy and discussed the new album’s sound, their headlining tour, and their writing process. Atwood Magazine: What immediately drew me to your band was the emotionally charged lyrical content. How do you guys decide which parts of yourselves you want to write about and share with the world? Conor Murphy: I think we really try to stay with a theme and focus lyrical content as much as possible. While we were writing, we had countless times where we all sat down and talked about the direction of the words. Going off that, is it difficult to be this vulnerable? Do you ever feel emotional when performing, or are you able step away from the song in the moment? Murphy: I try to step into it as much as possible. Playing every night for a month straight gets really emotionally draining. But it’s really the best way to make a performance mean something. It usually depends on how an audience is interacting with us. Murphy: The song is about the difficult nature of making any art. Like, you want it to be good and you want to be good at it, but to say you want to be good makes you bad. It’s like we all want to be successful at what we do, but it’s like the one profession where saying you want success makes you less successful. Nearer My God’s singles felt much different than those for Dealer, which was itself much different than your debut album, The Albatross. Are you intentionally trying to change your sound from record to record, or do you feel it’s something that’s happening naturally? Murphy: I’d say it’s happening naturally. We really didn’t set out to do something different. Just to make a record we love. Murphy: Usually we start from a project one of us works on from Logic and, if it peaks everyone’s interest, the rest of us pitch in until it’s finished. What was the process of trying to translate and perform “Nearer My God” in four other languages like? Murphy: We worked with over 70 translators to get a somewhat accurate translation of the lyrics. Then we went back and forth with demos of me trying to nail them phonetically. The whole thing took a few months and it was very difficult but we were so happy with it that I want to do it again with more songs on the next record. Do you think you’ll try to utilize all five languages when performing “Nearer My God” on tour? Murphy: Yes. Once we go to countries that speak those languages, we will try them out. Speaking of tour, are you guys excited to hit the road? How do you anticipate this tour contrasting from years past? Murphy: We are excited. We’ve been on the road supporting bands for years. So headlining now is the time where we see if that paid off. What have been some tour highlights for you all in the past, and what are you most excited to do/see on this upcoming tour? Murphy: Tour highlights have been mostly just great shows in cities we love. We always love going to Philadelphia. That’s where we have the most friends I think. Plus we’re playing our hometown of St. Louis at our favorite venue, Delmar Hall which will be really fun. What drives Foxing to keep writing and performing? What got you excited about Nearer My God? Murphy: I think we just love what we do and love our job. How important to you is your fan or audience engagement? With that, how is it knowing that your music moves listeners and creates such a large emotional response? Murphy: Very important. I think we had a really weird disconnection with listeners for some time. Like we went from not having any fans of our music to having quite a few. When that happened we just felt like losers who got popular for the first time. At this point though, we’ve come around to recognize the people who listen to our music are the most important people in our lives. And the emotional response they have is the most beautiful thing in the world to us. What do Foxing hope to be doing in the future? Murphy: Well, seeing as how much we love this record and how well it went with reception, we hope to write many more that we love. We hope to evolve and grow up and let our music reflect our age. What do you hope those who first discover Foxing through Nearer My God gain from its songs, and take away from your music? Murphy: I guess I hope people connect and relate with something from the record.